(Salem, Oregon) – Oregon Department of Transportation (ODOT) is reiterating that studded tires will not be allowed on Oregon highways until November 1, which is next week. “ODOT wants to clear up any confusion motorists are experiencing, after Washington State decided to advance the start of the studded tire season in Washington,” said ODOT spokesman Dave Thompson. Thompson said the studded tire season will begin on the usual date established in state law, which is November 1. Drivers who may be traveling through mountain passes should be prepared to use chains or other kinds of traction tire – or perhaps halt any such travel plans. Thompson said the two states will have different approaches because weather patterns are different in each area, as are travel patterns. 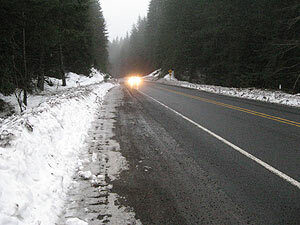 Studded tires cause around $42 million damage each year on streets throughout Oregon, which includes highways and county roads. Because of this, ODOT is encouraging drivers to consider other forms of traction until the November 1 deadline. ODOT’s budget allows crews to repair only about $11 million of this damage each year. Other types of traction tires are available. Traction tires that meet Rubber Manufacturers Association standards for use in severe snow conditions carry a special symbol on the tire sidewall showing a three-peaked mountain and snowflake. Research shows these tires provide better traction than studded tires when used on bare pavement and most winter driving conditions. If you are caught with studded tires outside of the allowed period, drivers can be charged with a Class C traffic violation, which currently carries a minimum $190 fine. Studded tires are legal from November 1 to March 1. Know Before You Go: Visit www.TripCheck.com or call 511 to determine the latest road conditions before you travel - before you commute to work or home. There are numerous construction projects along the Oregon coast and on the routes to the coast that are causing some delays. Click here for those.